Gary and Gloria were born again in Yeshua in early childhood and raised in Christian homes. They were married in 1973 and in 1976 both filled with the Holy Spirit. In 1978 they received a calling in their lives concerning their Jewish roots…to study the Hebrew roots of their faith. They both have grandparents that have Jewish genealogy. Gary and Gloria sang with a Christian Contemporary group called Covenant in the early 1980‘s and traveled with them 4 years in Iowa and South Dakota. They also led praise and worship for 29 years in various churches and have shared their music and teaching in many places, mostly in churches since they were married in 1973. They started recording music the Holy Spirit gave Gloria in 1999-2002 and produced 3 Messianic CDs. Gary and Gloria Vande Kamp were previously ordained by Calvary Messianic Congregation as ministers (Gary in 2001 and Gloria in 2006) and have officiated weddings, funerals, led Erev Shabbat and Shabbat services, led praise and worship and dance, and were Feast coordinators for 12 years. Gary and Gloria have both taken 3 years of Bible school. They sought out a Messianic Congregation since moving to Tulsa, OK in 1987 and have been a part of 4 Messianic congregations since that time, plus led a Sabbath group in their home for 8 years in the 1990’s as an interim between Messianic congregations. The Holy Spirit spoke to both Gary and Gloria simultaneously on a Sabbath day in April of 2013 and led them to start a new work. Gary and Gloria were praying about a Messianic covering and ordination and Rabbi Jeremy Storch came to mind. Rabbi Jeremy who is the Congregational leader of the Tabernacle of Praise in Branson, MO. called by the Spirit of the Lord’s nudging the day following Gary and Gloria’s resignation in April from the last congregation they attended and Gary and Gloria shared their heart about the covering and Messianic ordination which Rabbi Jeremy confirmed. 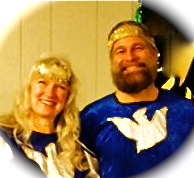 On September 22 at Sukkot celebration Gary and Gloria where ordained as Messianic Pastors. Elohim is aligning those with them that desire learning the depth of the truth of the scriptures and the intimacy of fellowship with Elohim in worship and with each other. Their Vision is Preparing those of the Remnant Bride that God leads to them for Yeshua’s coming. 19 Behold, I am doing a new thing! Now it springs forth; do you not perceive and know it and will you not give heed to it? I will even make a way in the wilderness and rivers in the desert. 20 I give waters in the wilderness and rivers in the desert, to give drink to My people, My chosen, 21 The people I formed for Myself, that they may set forth My praise [and they shall do it].